Cathie Filian: My New Hot Glue Tools! My New Hot Glue Tools! Finally, after a year of dreaming, working and tweaking details, I am pleased to announce Hot Glue Gun Helpers are finally available! Visit our official shop here! What are Hot Glue Gun Helpers? Acts as a landing pad for a heated glue gun. Heat resistant mat that hot glue will not stick to. Cooled hot glue peels clean from the mat. Protects tips of fingers while pressing. Hot Glue will not stick to the finger caps. Allows for “faster crafting”: your fingers are protected. Helpful for crafters with arthritis. 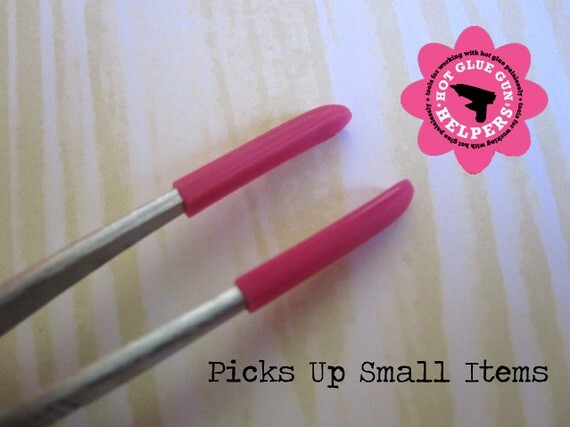 Tips allow for using a small drop of glue. Paddle end allows for a soft press. Allows the user to place small items (rhinestones & beads) into hot glue. Heat resistant tip that Hot Glue will not stick to. Better placement of items: the tweezer offers more control than fingers. 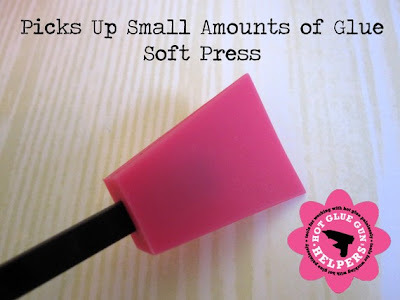 Allows for a firm heavy-duty press. Easy for the user to grip around or press from the top. 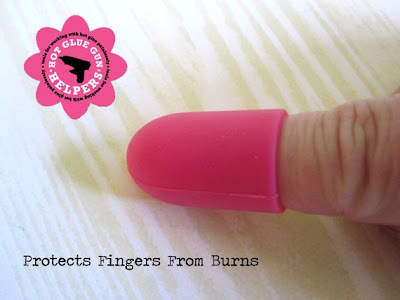 Allows the user to smear hot glue. When do they come out? I want a set now! Thanks! I am really excited about them. I am not sure when they are going to be available. Hoping to find out more details later today or tomorrow. I'll keep you posted. Oh be still my heart! Better yet no more hot glue burns on my fingers! I can't wait for these items to go on sale. i have a feeling these will sell like hot cakes! The painful burns are the deterrent that made me put mine away. Cant wait to see these hit the shelves! How cool! I will have to add these into my craftroom....now, where to put them. oowwww...i just burned my finger on my hot glue gun (no kidding)!! LOL! i need this little kit...cool stuff! I want the tweezers I dip a lot of plain metal brads into embossing glitter after heating them and my tweezers always stick leaving a flat spot or a spot that pulls away. It would be nice if it was made in another color other than pink or with less pink to appeal to men as well. I can see this being a cross gender product. The package is too pink for me and I am a female. What an ingenious idea!! Bravo, Bravo to you and everyone who helped create this saver from burnt fingers, you even devised different products for specific chores is just wonderful, you are on your way to victory. Congratulations! 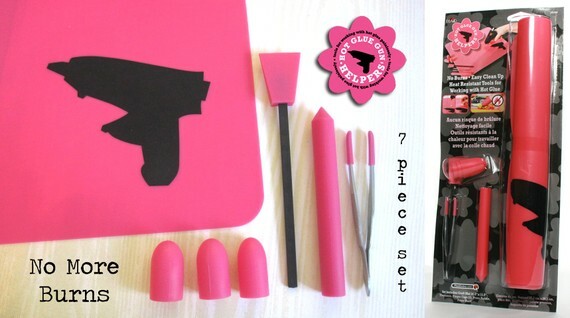 Could you please let us know when and where we can get a hot glue gun helper? I try to stay away from my HGG as much as possible because I am Always burning myself. I can't wait for these to come out so I can dust off my HGG and get crafting! Can I just shout Thank you! Lovely!!! It's something I can't live without. thank you!!! I saw these demonstrated at the CHA vendor show this summer. Where are they available? I love the concept, but before I can recommend to customers and students, I need to actually use the product. Help!!! Where can I get a set of these tools? Is there some where you can sign up to have your name on a pre-order list. When will they be available and what stores will carry them? They are not going to be available until January. I wish it was sooner.... I get emails everyday about them. I'll be shouting OUT-LOUD (lol) when they are on the shelves. It is January! Can we get a date and retail locations of where it will be available. I still don't have the list yet for Brick and Mortar stores.....UGH - believe me I am waiting too. I do have them at my etsy shop and I started a blog for them. Thanks Cathie! I ordered mine (3 sets)and added you to all my websites including face book......... Do you have a " glue gun helpers face book page? I thought you might want to know that when I did a search for glue gun helpers..... your etsy store did not show up. A store came up on Amazon that is why I ordered there. 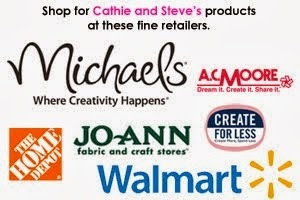 I'll try and help promote your store for you. Thanks again for creating such a great tools. Now i can drink my glass of cold h2o instead of putting my fingers in it! My Fingers will thank you cant wait to get these. LOVE the hot glue helpers. My husband bought them for my birthday! AWESOME! I've already made a house of cards, rabbit ear headbands and a flower pot looking creation from old magazines! LOVE LOVE LOVE it! GREAT JOB! I just got this off of HSN i have been wanting it since it came out. Last time I used my glue I got 2 degree burns and I was shocked I used it last night the rest of the stuff is great but the finger tips things are so small my finger went to sleep with them on before i glued ribbon around a 6×12 piece of paper they worked but could be bigger. Other wise if your big handed they may not work I hand man hands lol.I think the xl was left out of my package only got 3 need to be bigger. boohoo, can't find them in the UK so far ... could do with carrying these in our store here though.